DELTA State Governor, Senator Dr Ifeanyi Okowa has urged the Chairman of the All Progressive Congress (APC), politicians and political parties to be cautious in the choice of words and be decent in their approach to issues as activities towards the 2019 general elections commences. Reacting to questions about threats credited to Comrade Oshiomole that the APC will take over Delta State in 2019 at the 2018 second quarterly media briefing in Asaba on Wednesday Governor Okowa stated that Nigerians should not be divided because of politics. Delta State Governor, Senator Ifeanyi Okowa (right) addressing Journalist in Asaba, during the 2018 Quarterly Media Interaction Session, in Government House Asaba. “As politicians wherever you are, try to be civil in your approach to politics because that is the way it ought to be,” the governor said. He used the occasion to throw light on what transpired when PDP presidential aspirant and former Vice President, Alhaji Atiku Abubakar paid a consultation visit to Delta State. 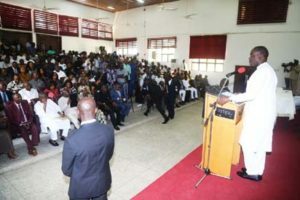 “If you followed us properly when he (Alhaji Abubakar) addressed Deltans, it was obvious that he made a lot of statements which did interest our people and he did say that he is a friend of the state and if his programmes as he says continues to interest the people, I will not be able to hold back the hands of the people; I am not going to force any Deltan to vote the way I think, Deltans who will be delegates in the convention will be allowed to exercise their discretion to vote, I am not the kind of person who insists on how a person should vote, so, if on his programmes he talked about restructuring and the people are excited and they want to follow him, they have that right, so, I made my statement and it was clear and cautious and when Sule Lamido came, he spoke so well and he is also a man I respect. He also has his followers in the state, he was well received and I made my comments so, it is my hope that all the presidential aspirants in the PDP will start to talk with each other because not all of them will get into the final stage,” he clarified. More than 200 journalists attended the media chat which was also, attended by the Deputy Governor of Delta State, Deacon Burutu Otuaro, and some members of the state executive council.